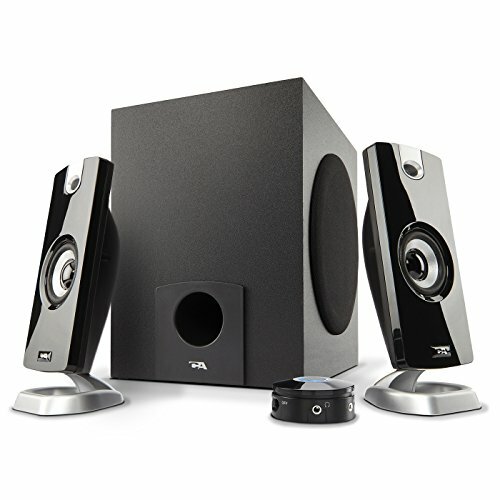 ROOM FILLING SOUND: Despite its compact size this subwoofer speaker system delivers amazing sound. With 18 watts peak power (9 watts RMS), you'll experience great sound to filling almost any room in the house. EASY TO USE CONTROL POD: The convenient control pod gives you full control over your speaker system. Turn power on and off, adjust the master volume, connect your portable gear to the easy access 3.5mm aux input (cell phones, tablets, MP3 players, gaming systems, etc. ), or plug headphones into the headphone jack for private listening moments. Separate bass volume control is located on the subwoofer. SUBWOOFER PERFORMANCE: The ported 4" side-firing poly carbon subwoofer delivers surprising bass performance. When combined with 2" satellite drivers, you can expect a great listening experience from most any device. CONTEMPORARY DESIGN: Timeless ﬂat panel designed stereo speakers with an efficient subwoofer provides a complimentary look for today's technology. QUALITY GUARANTEED: Includes 1 year hassle free manufacturer warranty. AC power 110V only.